In the email for the families regarding the Expo, ask them not to hand out candy. They can have snacks for their children, but overall it is a non-food event. Maybe let them know that no food will be sold. They should bring water bottles or use the water fountain. Each team is required to find one reviewer. Set out an empty box to collect clipboards, lanyards/badges, pens, etc. Check music and set up for DJ - MAKE THEM TEST THE MUSIC!!! Explain the seating plan to the ushers!! Assign two teams per pair of reviews, one "odd" and one "even"
DO NOT LEAVE THE AWARDS CEREMONY EARLY, if you can't stay until the end, leave before it starts and get your medal from your coach later. ​Please don't eat or drink in the auditorium or gym. If you need a snack, find a spot in the cafeteria. Please do not hand out candy or food to anyone but your own child. Overall this is a non-food event, purposely scheduled after lunch and before dinner. Ask coaches to keep their teams in the gym or the cafeteria, depending on where they go first, until 2:00 p.m. or an announcement, even if they are "finished"
Look at other team's models and "show-Me posters"
Tom will thank coaches, families, sponsors, entertainment, Mike Gentry, G-REC, Kelley, Ji Hyun, Glendaly, Seth, the Glastonbury BOE, etc. Call the student mentors on stage first (say each name but don't wait long, just one after another as they all run up) to start the high five line and help hand out medals. Wendy will hand out their gifts and documentation of volunteer hours (because I know all their names, matching their certificate). Thank and call up reviewer next (as a group), also to join the high five line. We will need to collect all trash and papers from the tables and auditorium seats and throw it out. Especially any tape we used to put up signs for seating and model placement. 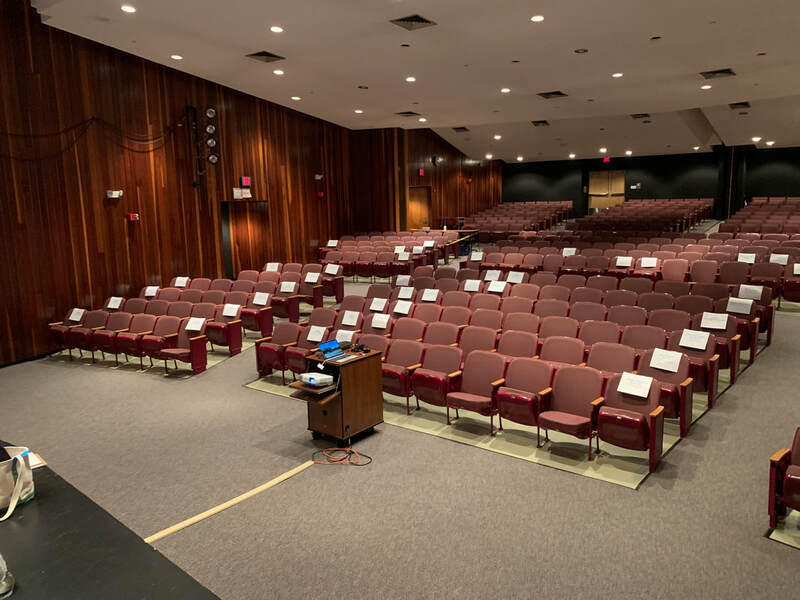 Photos of auditorium layout 2019 and the "labeling" of the seating in the auditorium. 8 seats per team, as mentors end up on stage for the awards portion. Need table on stage for medals, certificates and gifts. Coaches should set up models and poster boards in the cafeteria before we begin. Group A 1:30 p.m. - 1:50 p.m.
Group B 2:00 p.m. - 2:20 p.m.
should go to the gymnasium to burn off some energy with Elite Karate. Teams are assigned to reviewing groups, either "A" or "B." Hopefully we will have eleven pairs of reviewers. All but one pair will review two teams. 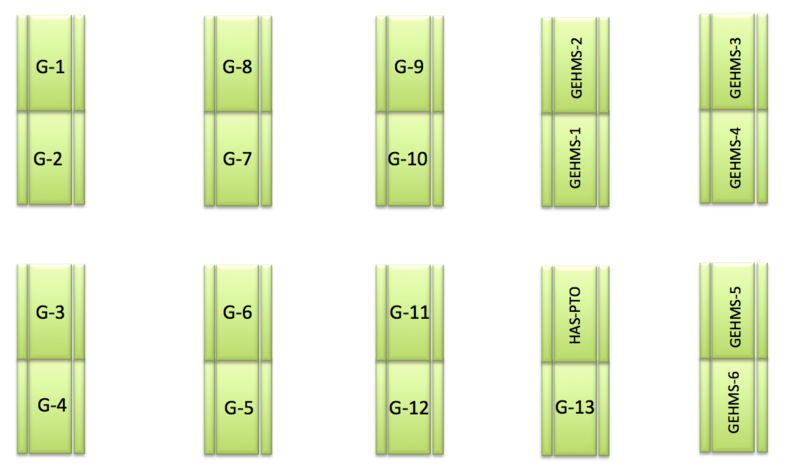 Below, the green rectangles represent the tables in the Gideon Welles cafeteria. (They have attached benches, which is inconvenient but unavoidable.) This is the plan for the table arrangement on Saturday for the Expo. A piece of paper with each team name and number will be taped to the corresponding table so coaches know where to set up their team's "Show Me" poster and LEGO model. 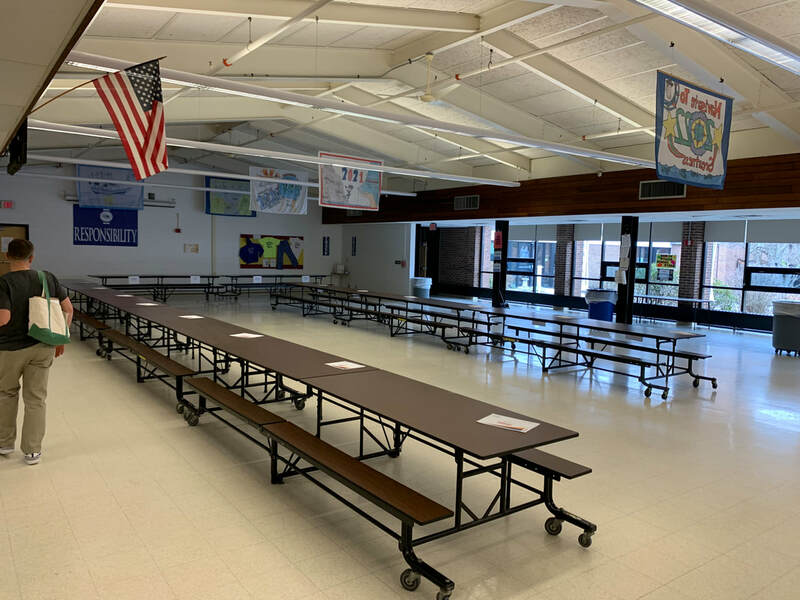 Coaches should set up these before we begin at 1:00 p.m.
***Water Winners - I'm not sure where we will fit the 21st table; it will depend on the opinion of the head custodian. Please look for a table with your name on it the day of the Expo. It will probably be on one end or the other (i.e. not in the middle). Thank you. It's a wonderful experience to hear it all. Reviewers will work in pairs. Each pair can interview one team in Group A and one team in Group B. (We have a 21st team attending, so an 11th pair will interview that team.) Each pair of reviewers will be assigned specific teams, not one with which they have a personal affiliation. The reviewers will be lent clipboards and will have a sheet to fill out for each team (see right). The pair will talk with the team for about 10-15 minutes. 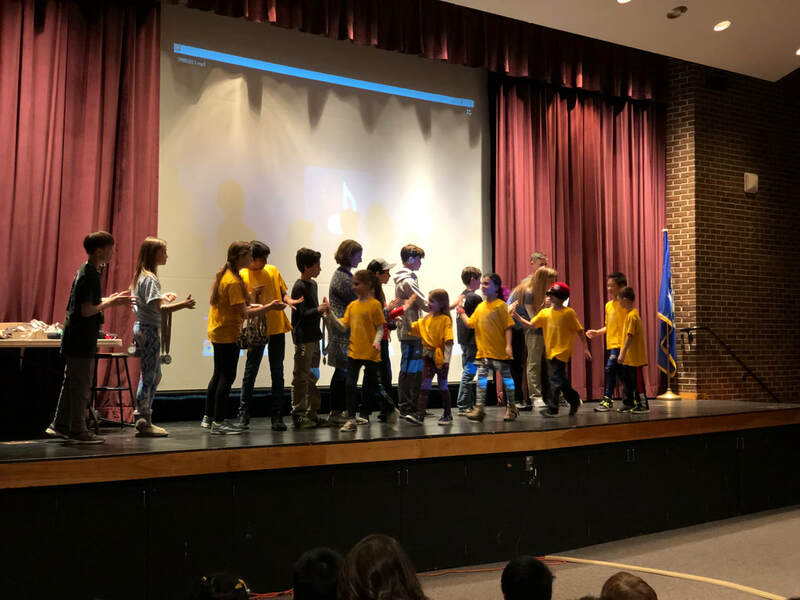 For many of the FLL Jr. teams, this is their first experience with intellectual teamwork and giving a presentation to adults. Be sure to be patient with them and only positive. Criticism is not useful in this situation, although thought-provoking questions are encouraged. You are not judging them; instead, you are showing interest in their ideas and experiences, encouraging them to continue learning. In FLL Jr. everyone is a winner and all the kids should feel proud of their accomplishments. Below is a list of sample questions that reviewers might choose – be sure to ask age appropriate questions. Some students are quieter than others, so please ask questions to individual team members so they are all included. Reviewers are asked to arrive at noon. We will meet in the faculty lunchroom. G-REC will provide pizza for the reviewers. Wendy will give a brief presentation to the group to review their role, and experienced Head Reviewer Trina Williams will be on hand to answer questions and support the reviewers. When the reviewing is finished, reviewers can leave if necessary, or else hopefully stay to take part in a hi-five line on the stage as we call up the teams for the closing ceremony. • What are your names? • What is your team name? • How did you choose your team name? • What was the most fun part of FLL Jr. (team meetings, learning, building, etc.)? • What did you like best about working on a team? • How did your coach help you? • How did you decide what your model would be? • Why did you build this model? • How does your model reflect what you learned about? • How does your model work? • Are there any motorized parts? • Did you learn about or build any simple machines? Can you tell me about them? • How did you use the WeDo? • Can you tell me about the WeDo programming? • What did your team learn about water use? • What water use did your team choose to learn more about? • Why did you choose this water use? • Can you please explain your poster to me? • Did your learn about any challenges with this water use? If so, what are they? • Did you go and visit any person or place about the topic you chose? • ​What kind of people study or work on this subject as part of their job? • What was the most interesting, strange, special or different thing that you learned about your topic? After reviewing a team, each reviewer will hand in their sheet with notes. These notes will be used to get unique information about each team. The announcers will need a couple sentences to say when calling each team onto the stage for their medals. We will be (probably frantically) compiling this information and assigning awards during the 45-minute magic show. During the awards ceremony, teams will be called up on to the stage one by one. The will each be recognized for what they learned, build and presented. Each child will receive a medal to take home. 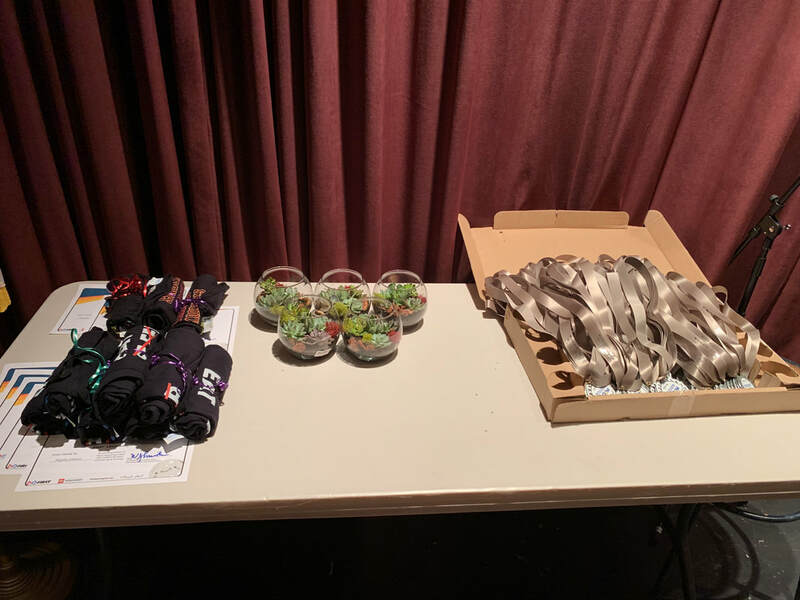 Coaches also will have the option to fill out certificates that have been printed and will be placed on the tables where you are setting up your displays. Coaches, PLEASE tell the parents of your teams that if they are going to stay to receive their child's medal, they need to stay until the end to clap for the last child. If they can't stay for the whole long, tedious process of calling 21 teams up onto the stage, then they should leave before the awards ceremony begins so as not to disrupt the ceremony and make the kids who randomly end up getting called last feel less celebrated and valued. We need to set up the computer and make sure I can play a few powerpoint slides on a screen in front of the stage for the welcome. Then we need to know how to get the screen up and out of the way after the welcome. 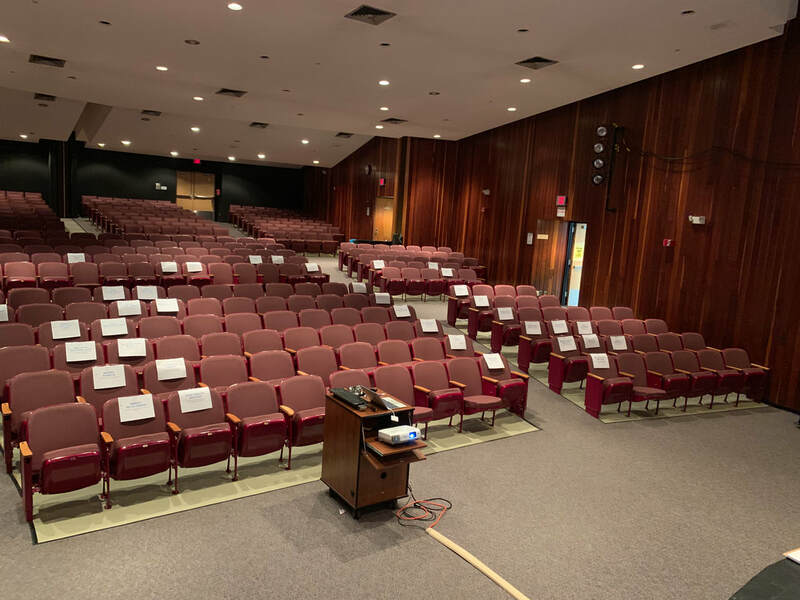 The front rows in the auditorium need to be labeled for the 21 teams - 6 kids and 2 coaches and possibly a mentor, so that the participants can get up and down quickly and not be stuck in the middle or too far back. ​Medals and hand sanitizer in place in the auditorium. The tables in the cafeteria need to be labeled for each team, according to the map. We need to get a table set up for team #21. Pizza delivery person needs to be paid upon arrival and pizza brought to the reviews in the faculty cafeteria. Drinks, cups, napkins, plates, fruit and cookies need to be set up in the faculty cafeteria for reviewers. Each clipboard needs a pen, instructions, and reviewing sheets for the specific teams. Box set out to collect reviewer clipboards, pens and badges at the end of the reviewing session. Set up FLL table, mat and mission models, get FLL students settled. Coordinate with karate school on gymnasium activities and any set up needed. I need 20 reviewers. The reviewers are invited to a pizza lunch in the faculty cafeteria. I will give them an overview of what the reviewing process entails and will hand out the materials they will need (clipboard, sheet for notes on each team, etc.) Trina Williams will be on hand with the reviewers to help with any questions. The reviewers will work in pairs. At 1:30 p.m., they will approach their first assigned team. The tables are spaced to try to give the most room. They should complete the interview by 1:20 p.m., allowing themselves time to agree on a few summary sentences describing the team and their work. 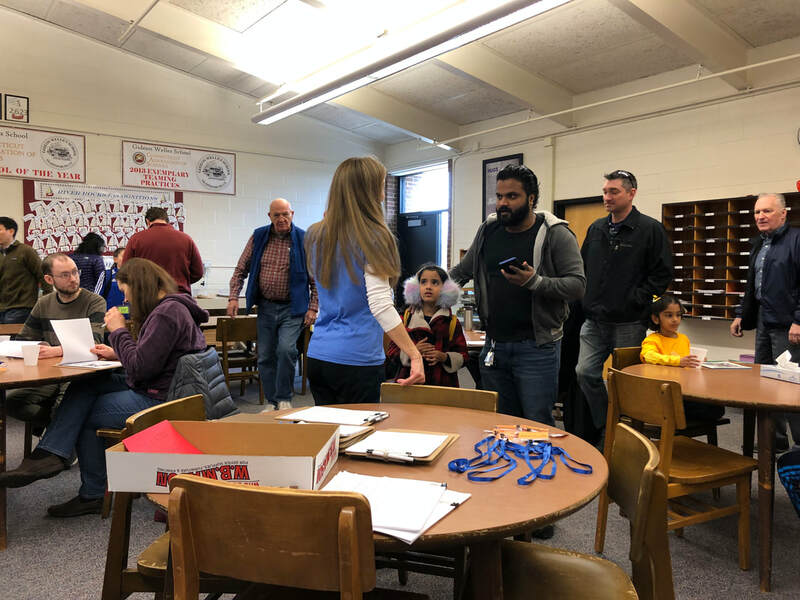 They can hand in those sheets and go back out at 2:00 p.m. to their second assigned team, finishing up by 2:20 p.m. All reviewers are invited (but not required) to stay for the awards ceremony to take part in a hi-five line on stage. I'd like to have two people waiting by the doors to hand out programs and answer any questions on where folks should go. 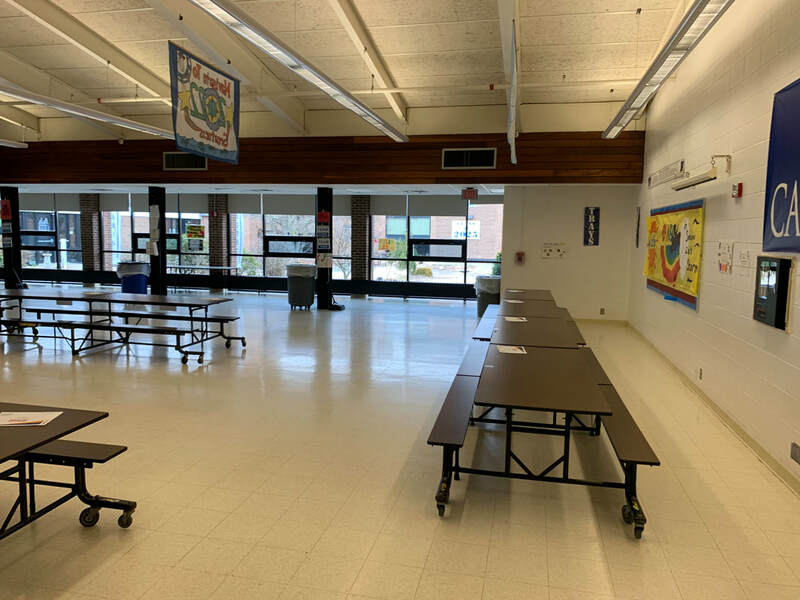 Coaches should start arriving at 12:45 p.m. to set up their posters and models in the cafeteria, and everyone else should all head to the auditorium for the 1:00 p.m. start. I have one minute clips of different cheerful songs that need to be played after each team is announced while the kids run up on the stage, hi-five adults and collect their medals. I need a DJ to start a song after each team is announced as the kids are running up, stop the song as soon as the kids make it off stage, and be ready to play the next song once the next team is announced. There will be 21 teams coming up to accept medals. We need folks to be in the auditorium guiding teams to their assigned rows at the front and families in the back twice, for the 1:00 p.m. welcome and for the 2:30 p.m. magic show. It would be great to have some folks on hand to help herd the crowds. We will need to send the "even's" to the cafeteria first and the "odd's" to the gymnasium. Then at 1:55ish, the teams need to switch places. Everyone needs to get to the auditorium for the magic show at 2:30 p.m. Also, I'm hoping that two runners could serve as reviewers for the one extra team attending. Start at end of Expo, between 4:00 and 4:30 p.m.
We will need to collect all trash and papers from the tables and auditorium seats and throw it out. Especially any tape we used to put up signs for seating and model placement. I will need folks to collect and sign in the materials borrowed by all coaches that are finished at the end of the Expo. I will have a checklist (with pictures) for each team. We'll have to clear out any leftover food from the faculty cafeteria, and also break down and load up the FLL table. GLASTONBURY PUBLIC SCHOOLS PROVIDES PARTIAL FUNDING TO SUPPORT OUR STUDENTS.